This little fellow however is just about the right size. It comes from Sprüngli, the finest patisserier and chocolatier in Switzerland in my opinion (the more internationally known Teuscher is a distant second). The body is a creamy chocolate filled case, and the wings are almonds. He looked so cute that I could barely stand to eat him but, of course I did, right after I took this photo. Submitted by maki on 2004-05-19 10:40. Your chocolate bug is gorgeous - and, I bet, delicious, too! by the way, your recipe for the rhubarb crumble pie was super. everybody wants me to make another one now! 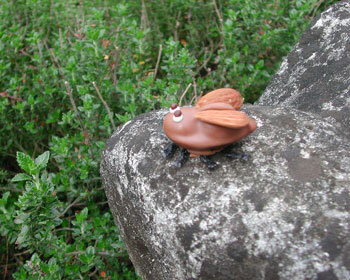 I'm sick of the cicadas (I live in Maryland), but I'd love to be invaded by these chocolate bugs!!! That's so cute and adorable! Laura, I'm not sure of any food events in September in Zürich off the top of my head but I'll find out and post it here if there are. Now that's a chocolate bug I'd actually be willing to eat.